If you want to turn up the heat, add more chilli, but only a little at a time! 2. Heat 1 tablespoon of the oil in an ovenproof casserole set over a high heat. Add the beef and cook for 5 to 7 minutes, until browned all over. Transfer the beef to a plate. 3. Add the remaining tablespoon of oil to the casserole and turn the heat down to medium. Add the onion and mushrooms and cook for 2 minutes, then add the chillies, garlic, ginger and five-spice powder and cook for 1 or 2 minutes. Add the stock, teriyaki sauce and orange rind. Bring to the boil, then return the beef to the casserole. 4. Cover tightly with a lid and transfer to the oven for 2 to 2½ hours, checking occasionally to ensure the liquid has not evaporated. 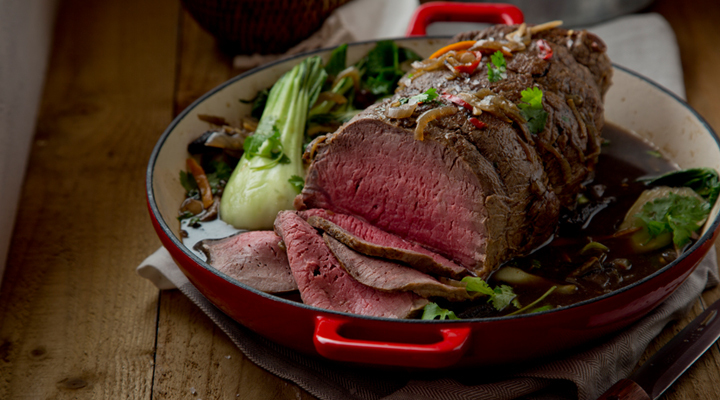 When the beef is done, remove the casserole from the oven, check the seasoning and add the pak choi. Return to the oven and cook for 5 to 10 minutes more. 5. Transfer the meat to a cutting board and carve into slices. Serve with some of the delicious cooking juices and pak choi. Garnish with the fresh coriander and serve immediately with steamed rice.